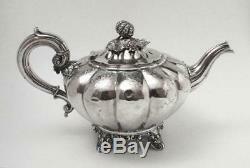 ANTIQUE VICTORIAN ENGLISH STERLING SILVER MELON TEAPOT EDWARD & JOHN BARNARD. EXCEPTIONALLY FINE & IMPRESSIVE VICTORIAN ENGLISH STERLING SILVER TEAPOT BY EDWARD & JOHN BARNARD. Presenting an exquisite Antique Victorian sterling silver teapot, expertly hand crafted and beautifully hallmarked by the renowned and highly collected London Silversmiths, Edward and John Barnard in 1855. This exceptional example has a melon shaped body with finely engraved ornate scrolling radiating from the scalloped top rim. The impressive hallmarked fluted c-shaped handle, with scrolled thumb rest and inset bone detailling culminated in elegantly scrolled tips with beautifully modelled leaves connecting the handle to the body. The stylishly curved swan neck spout features organic fluting which beautifully enhances the sparkle of the silver and perfectly balances the form. The hallmarked hinged dome lid, with scalloped edge, is surmounted with the original hallmarked leaf and fruit finial, which in itself is an exceptional example of masterful silversmithing. This teapot elegantly stands atop four fine and impressive scrolling leaf feet with elaborate ornate chased decoration. The elegant feet perfectly elevate the impressive form allowing it to be fully appreciated. This exceptional example is presented in good antique condition with no breaks, losses or repairs. There are some light indentations to the widest parts of the melon-shaped body, far less than would reasonably be expected with an antique piece and in no way detracting from its beauty. This piece has been exceptionally well cared for and presents spectacularly. We have given the exterior a light polish. The interior would benefit from a clean. This piece is beautifully hallmarked to the base with a lion symbol indicating a sterling grade of silver purity, the leopard town mark for the city of London, the date mark "U" for the year of 1855, the makers mark for Edward and John Barnard and the Queen Victoria duty mark. An addition cross mark appears beneath the duty mark. The finial is stamped with the sterling silver lion mark and markers mark. A sterling silver lion and London mark appears to the handle, and the underside of the lid is hallmarked with a silver lion, the year stamp and the makers mark. This impressive piece stands approx 165mms tall, measures 290mms in length from the end of the handle to the tip of the spout and 175mms in width. This piece has been crafted in a lovely thick gauge of silver with a substantial total weight of 715 grams. This exceptional Victorian era piece would make an outstanding addition to any antique sterling silver, Edward and John Barnard or quality teapot collection. A wonderfully stylish and elegant antique feature for any home and a fabulous gift idea for discerning admirer of fine quality Victorian objects of sheer beauty! International buyers are most welcome. Sorry, no personal cheques accepted. All items are professionally packaged using quality materials. We individually hand select quality vintage, antique, well designed and hand crafted pre-loved items, and proudly offer our finds for sale. We aim to describe and visually represent our items as accurately as possible. Get Supersized Images & Free Image Hosting. Create your brand with Auctiva's. Attention Sellers - Get Templates Image Hosting, Scheduling at Auctiva. The item "ANTIQUE VICTORIAN ENGLISH STERLING SILVER MELON TEAPOT EDWARD & JOHN BARNARD" is in sale since Thursday, March 15, 2018. This item is in the category "Antiques\Silver\Sterling". The seller is "threetreefrogs" and is located in melbourne.